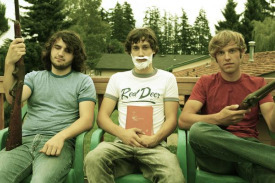 Who: The Lonely Forest from the small town of Anacortes, WA. What: Ah, the good stuff that ends up in my inbox. Doing my best to keep my ears open, hopefully I won’t miss too many bands like The Lonely Forest. Seems as if a ton of people already know about this group as they have press from everywhere. They’ve been doing some festivals, played sessions at KEXP, and shared the stage with bands like Mates of State, Viva Voce and The Thermals. Okay, I’m late on this one. But I can tell you something new, they have a new album called ‘We Sing The Body Electric!”, out on Burning Building Recordings. Abandoning the experimental rhetoric of their previous release(s), The Lonely Forest have embraced their knack for writing unforgettable and realized pop songs. Here’s one of the those, enjoy. Song: We Sing In Time.